"I'm certain there could be no better candidate to lead the World Bank than David", Trump declared, noting Malpass's long support of his candidacy and outspoken critique of the organization. Nominee David Malpass, a senior official in the Treasury Department, is known as a Trump loyalist and an advocate of "pro-growth" policies who has vowed to reform the global development lending institution. President Trump nominates Treasury Department official David Malpass to lead the World Bank. Beginning Thursday, the bank's board will accept nominations until March 14 and plans to name a new president prior the International Monetary Fund and World Bank Spring meetings, set for April 12-14 in Washington. He was an economic adviser to Trump's 2016 election campaign. 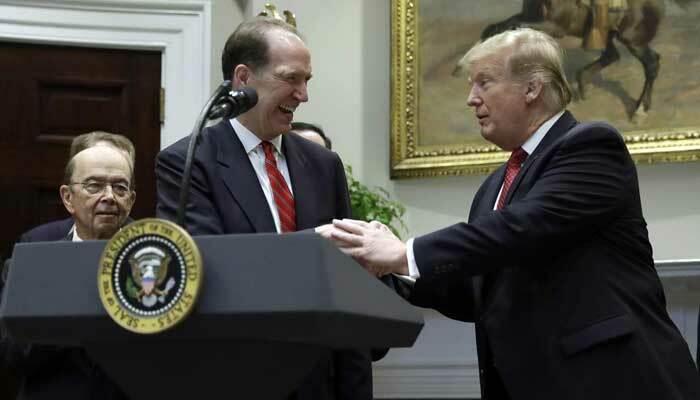 "He has fought to ensure financing is focused on the places and projects that truly need assistance, including people living in extreme poverty", Trump said from the White House, with Malpass at his side. "I'm very optimistic that we can achieve breakthroughs to create growth overseas that will help us combat extreme poverty and create economic opportunities in the developing world", Malpass said. Malpass declared in 2017, "The World Bank's biggest borrower is China". Malpass will travel next week to Beijing to participate in trade negotiations and then will go to Japan, the World Bank's second largest shareholder. But as Trump's "America First" trade agenda and tariff war with China puts strains on many developing economies, some development experts say that Malpass' candidacy will be a hard sell. A senior Trump administration official said Mr Malpass would honor the bank's standards and obligations, including its initiatives to combat climate change. As president of the World Bank, Malpass plans to advance "broadly shared growth in the countries that need it most and ... focus building and expanding a robust middle class in emerging economies", according to a senior administration official. "David Malpass would be a disastrous, toxic choice for World Bank president", said Tony Fratto, former Treasury assistant secretary in the George W. Bush administration.